I’ve noticed that there are some interests, hobbies and products that draw people together. My dad has a vintage Alfa Romeo, and when we went for drives, owners of similarly beautiful-but-impractical cars would nod or lift an index finger off their steering wheels in a subtle salute. This has followed me into adulthood, although our nodding fraternity choices are a Brompton bicycle and an Ergo carrier. But as I spied a knitting needle case on the table at a recent play date, I realised that there is a similar clanship among people who make. About 75% of my friends are makers of some sort. A reasonable percentage of those have made things since childhood, before the recent crafting boom. Interestingly, LYM’s friends from school are consistently excellent makers and top quality pals. For that reason, we asked Liz to be Little Lion’s godmother. Not only can I rest safe in the knowledge that Lion will have a better understanding of cricket than I, she will be sure to know how to dance with decorum (even if she chooses not to) and will always, always submit her taxes well before the deadline. In addition to these skills, Liz turns her hand to quite an enviable array of making genres from knitting to tailoring. So when she presented Little Lion with this beautiful rabbit, we were thrilled for all sorts of reasons. 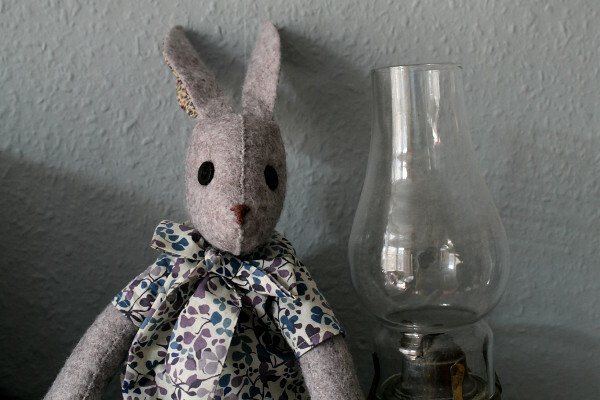 It’s a gorgeous bunny, beautifully made, with a properly serious grown up expression – just a hint of Waldorf doll about it (we take our teddies very seriously in this house). But best of all it’s an entirely unique and handmade thing, which she will learn to treasure (as soon as I decide to let the bunny down off the mantelpiece, which may take a few years)! 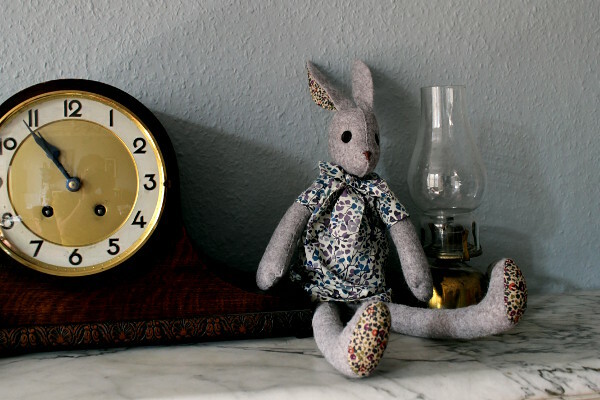 You can read all about the bunny’s creation on Liz’s blog here!